The Miami Heat have won five of seven since the All-Star break, all without star forward Chris Bosh. Injuries can sometimes have an unintended, positive effect on an NBA team’s trajectory. In the most recent NBA Finals, the Cavaliers adopted a brutish style of basketball without Kyrie Irving and Kevin Love, seemingly slowing down the Warriors to give themselves a puncher’s chance in the series. Earlier last season, the Warriors themselves discovered a new identity after an injury, with David Lee’s absence giving way to Draymond Green, who played himself into a one-man, small-ball death machine—and a huge contract in the off-season. And four years ago, when LeBron James won his first NBA title, a mid-playoffs injury to Chris Bosh forced Erik Spoelstra to “adapt or die,” and his embrace of small ball—with Shane Battier playing power forward—propelled the Heat to a championship. When Bosh missed this February’s All-Star Game with what has turned out to be his second blood-clot scare, the Heat had to be thinking the worst. For the second straight season, the franchise’s star was dealing a possible career-threatening injury. 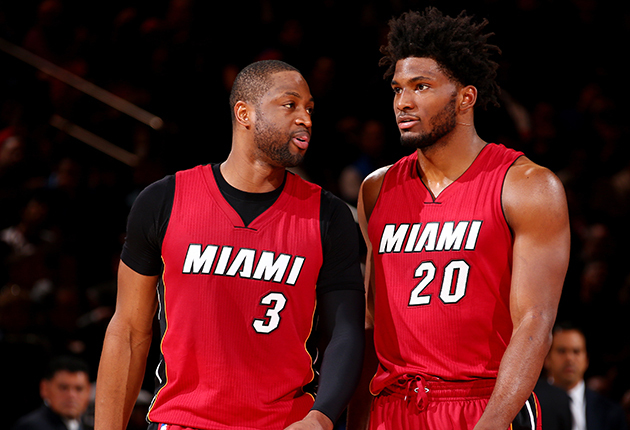 Last year without Bosh, Miami stumbled to a lottery finish. ​But Bosh’s injury has had another effect entirely. Without their multi-talented big man, the Heat are surviving—thriving?—in a competitive race to stay in the top half of the Eastern Conference. Thanks to a new-found balance and contributions all over the roster, the Heat have won five of seven since the All-Star break—all without Bosh—culminating in a 68% shooting, 129-point offense explosion against the Bulls on Tuesday. The Heat’s transition to an offense with firepower—Miami is averaging 108 points in its last seven games—starts with Goran Dragic and Hassan Whiteside. Dragic and Whiteside entered March as the Heat’s best two-man combination over their last 10 games, a testament to Dragic’s aggressiveness and Whiteside’s across-the-board improvement. Whiteside flashed his talent when he broke through last season, but has since often frustrated fans and teammates with his lack of attention to detail. The Heat’s center has turned up his play without Bosh, recording six straight double doubles, all while coming off the bench. Whiteside has noticeably improved his screen-setting, unleashing Miami’s pick-and-roll game, and is playing much more fundamentally sound defense, using the fear of the block more effectively than ever. The fact that Whiteside has agreed to a bench role even with free agency looming hints at improvement in attitude. “The team is just playing really well. With Bosh out, I have a bigger role on the team,” Whiteside told SI.com. As for his relationship with Dragic, he agreed their chemistry has improved as the season grew. ​Dragic told SI.com all the way back in December he preferred playing lineups with Luol Deng at the power forward spot, as it opened up his offense. With Deng playing Bosh’s position out of necessity, Dragic has thrived. The Slovenian point guard—who calls himself the Dragon—has taken charge of Miami’s offense in its last seven games. And the contributions are coming from all over the roster. In his new role, Deng has thrived at power forward. He shot out of the All-Star break with five straight double doubles, and has looked the more comfortable than he has at any point since joining the Heat in 2014. Indeed, Deng is in more motion, finding himself all over the floor as opposed to the corner. Deng is scoring more often off pindown screens and post-ups, and his hard cuts to the hoop are leading to more easy baskets. ​In addition to Deng, Amar’e Stoudemire has somehow given the Heat quality minutes in a small role at center. Rookies Justise Winslow and Josh Richardson have also come into their own, with Winslow overcoming his shooting struggles due to an attack-the-basket mentality, and Richardson earning more and more minutes with tenacious defense and timely offense. Josh McRoberts was also playing his most inspired brand of basketball in Bosh’s absence, though the addition of Joe Johnson has seemingly pushed him out of the rotation. Johnson has started in each of his two games with the Heat, and he scored 24 points on 10-of-13 shooting Tuesday. The Heat veterans spoke highly of Johnson, who was heavily recruited by Wade and others to join the team. Even if the seven-time All-Star can only hit threes at a consistent rate, Johnson could add a whole new dimension to a Heat offense that struggles outside of the paint. By simply replacing Gerald Green, who has been mired in a months-long shooting slump, Johnson makes the Heat offense significantly more potent. Of course, the recent stretch is not without its caveats. The Heat lost an important game to Boston on Saturday, a loss that could have playoff implications when it comes to seeding. And Miami’s wins during the stretch include victories over a depleted Bulls team, an average-at-best Wizards squad and the floundering Knicks. If anything, the Heat’s resurgence begs the question how good the team could be with Bosh back in the lineup. Bosh is by far the Heat’s best player, and he was consistently hitting threes, midrange shots and playing tough pick-and-roll defense while he was in the lineup. Bosh proved during the Big Three era how well-suited he was to playing as the only big man in the lineup, and he likely would have thrived in Miami’s new-look frontcourt. Spoelstra has stuck to an eight-man rotation since the addition of Johnson, which has moved Green and McRoberts to the bench. Green’s absence makes sense, but the banishment of McRoberts less so, especially after the forward put together his best stretch in a Heat uniform. With a veteran team—and perhaps more buyout help on the way—Spoelstra may want to work in one or two more players to the mix. So what is the Heat’s ceiling? Before a Sunday win over the Knicks, Spoelstra spoke of embracing the opportunity to square off against other East teams down the stretch. Deng stated the team’s goals much more clearly.